The date was December 22, 1922. At that time, the event was not one that would mark any particular group or place. Five Colorado Springs men decided that, because the average social events of New year’s consisted of somewhat boring parties and dances, they would venture to do something unique and that no one had done before. They would climb Pikes Peak in the dead of winter on New Year’s Eve. The weather on December 31st was much like the Christmas snow storm of 1982 that many of you may remember. 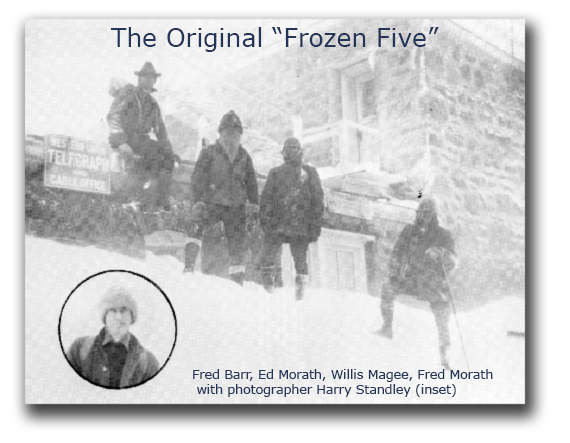 Cold weather gear as we know it today was virtually unheard of in this part of the country.The group consisted of five men, Fred and Ed Morath, Fred Barr, Willis Magee and Harry Standley. Fred Morath was actually the “ring-leader” of the group and he was no stranger to the many mountain peaks of Colorado. His brother Ed had a similar personality and together they formed a perfect mischievous and adventure loving team. Fred Barr was without a doubt the miracle man of Pikes Peak. He had just completed his trail from Manitou to the summit of the peak as well as 16 additional miles of trails to Cameron’s Cone, Bottomless Pit and other areas. He worked in the coal mines during the winter months and saved enough money for dynamite to build his trail during the summer. Then there was the infamous Harry Standley. He had become quite an expert photographer in Cripple Creek during the boom days, and had photographed all of Colorado’s 14,000-foot peaks. He not only took shots from the bottom, but had photographed from each summit. Lastly was Willis Magee. He was a banker and accountant by trade and although he was reliable and methodical, he was a born risk-taker and loved the chance to do something unusual. Their equipment that day consisted of hobnail boots, breeches, stocking caps, sheepskin coats and silk stockings for face masks. Since the snow was so deep that year they decided to tackle the peak via the Cog Railway Route, which began its operation in 1889. While this was a shorter route, 9 miles compared to the 13 miles on Barr Trail, it was also considerably steeper and more dangerous, with grades as much as 27% in the last two miles. So that cold December morning these five fun-seekers began their journey up the steep slopes of the Cog Railway tracks and they picked up flares along the way, left there by railroad workers. At Windy Point, 12000 feet high, conditions were almost impossible, as the wind had pushed huge snow drifts over the right of way. One slip might have meant a slide of several hundred feet down into huge boulders. Hours later, the “frozen five” as they would later be named, sighted the huge tower of the old summit house as it moaned and groaned in the bitter cold wind. Snow had drifted so deep near the huge steel doors of the summit house, that they entered through a second floor entrance. Once inside they managed to start a fire in the old potbellied stove and soon frozen eyelashes, noses, fingers and toes began to thaw and their faces began to glow with the thought of their accomplishment. They ate, sang songs, and waited for the midnight hour. Then at the stroke of midnight, they lit their flares and the other fireworks they had hauled up the mountain, and built a huge bonfire of old railroad ties. 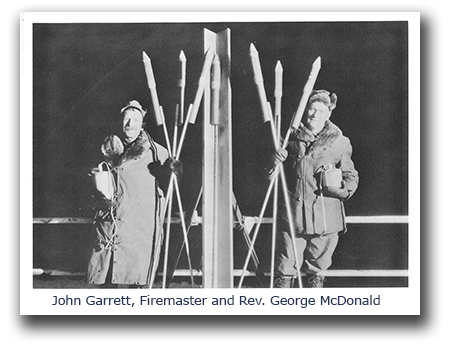 They celebrated New Year’s 1923 from the summit of America’s mountain. Within minutes people from all over the Colorado Springs area began notifying the police and the newspaper, calling attention to the strange lights and fire on the summit and wondering who in the world would venture up there of all places, on New Year’s eve? For 90+ years, the club has grown, thrived and become part of the rich heritage of the Pikes Peak Region. It is a unique event in all of America. The fireworks display at the stroke of midnight gives the grand old peak a crown of jewels to start the New Year with hope and enthusiasm. The Pikes Peak Adaman Club has certainly come a long way since the club’s beginning. Still it is good to know that in our modern time of doing things the easy way, there are still folks who love to get out at this special time of the year and carry on the tradition and heritage left to us by these men we lovingly call the “original Frozen Five”.